You may think of heavy duty mobility scooters as having a higher weight capacity, but they're so much more than that. Heavy duty scooters for adults provide increased stability for riders that need a scooter with a higher weight capacity, and reduce the chances of tipping. Bariatric scooters are also ideal for riders that will be spending time outside. 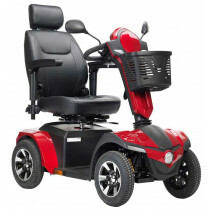 These heavy-duty mobility scooters provide access through all types of terrain and will enable the rider to carry on with normal, daily activities. Riders won't have to worry about getting stuck or having to miss out on something because of their scooter. Heavy duty electric scooters for adults are generally faster than other types of scooters and can travel longer distances per charge. They have many customization options to meet a variety of needs. Whether the rider is going to the store, a restaurant, out in the yard or just another room of the house, these mobility scooters enable the rider to get to their destination hassle-free. On what kind of terrain will you be driving? Do you require a higher weight capacity? Do you need to transport this scooter in a car? What kinds of special accommodations do you require? Heavy duty electric scooters have larger motors than the average scooter, enabling them to maneuver a variety of terrain efficiently. They also have a longer travel range per charge. 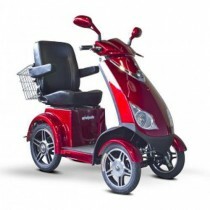 The Heavy-Duty Mobility Scooter EW-72 is able to travel up to 43 miles per charge and reach speeds of 15 MPH. These mobility scooters also generally have larger tires that provide stability and smooth navigation. Heavy duty mobility scooters have no problem handling wet grass, gravel, hills, dirt and even curbs. Heavy duty mobility scooters do have a higher weight capacity than other types of scooters. While the average scooter has a weight capacity of 250 lbs, heavy duty scooters can carry 350-600 lbs. If you are looking for a scooter with a high weight capacity, you may try the EW-66. This scooter has a weight capacity of 600 lbs and it can even hold two people. Scoot alone...or with a friend. Just because you're purchasing a bariatric scooter, doesn't mean that you need to sacrifice portability. If you need to transportable scooter, try the Phoenix 4 Wheel Heavy-Duty Scooter. It has a weight capacity of 350 lbs but can also be disassembled into four pieces, without the use of tools, making this heavy-duty scooter stable, yet easy to transport. 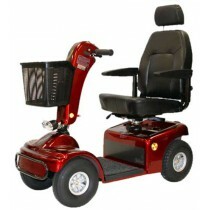 Heavy duty mobility scooters provide accommodation for riders with varying abilities. If the rider has limited strength and/or dexterity, you might want to consider a scooter that has more accessible throttle and steering options. The Phoenix 3 Wheel Heavy Duty Scooter has a finger-pull throttle that is easy to access and grip. Most heavy-duty scooters have an adjustable angle tiller which enables the rider to move the controls into a customized driving position. For riders who want more back support the Cobra GT4 Heavy-Duty Mobility Scooter has a captain's seat with an adjustable head rest. 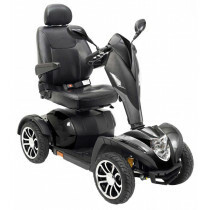 If the rider is above or below average in height, you will want to consider a scooter with height adjustable seats and armrests. For riders who will be using their scooter at night, investing in a scooter with headlights is a good option. These adjustable, easy-to-maneuver, heavy duty scooters will provide a smooth and efficient ride, every time. The rider won't have to worry about navigating rough terrain or running out of battery power. They will be able to get where they need to go with ease and be able to carry on with their usual daily activities.